It’s August (OMG what? how? ), and my mailbox has been swimming with wedding invitations for the fall season. I’ve seen prints with Philadelphia skylines and elegant navy blue and gold foil mounts, but I’ve yet to see something that completely takes my breath away - that way I felt when I saw my own wedding invitations, four years ago (yep, obsessed and will be for as long as I live, whoops!!). 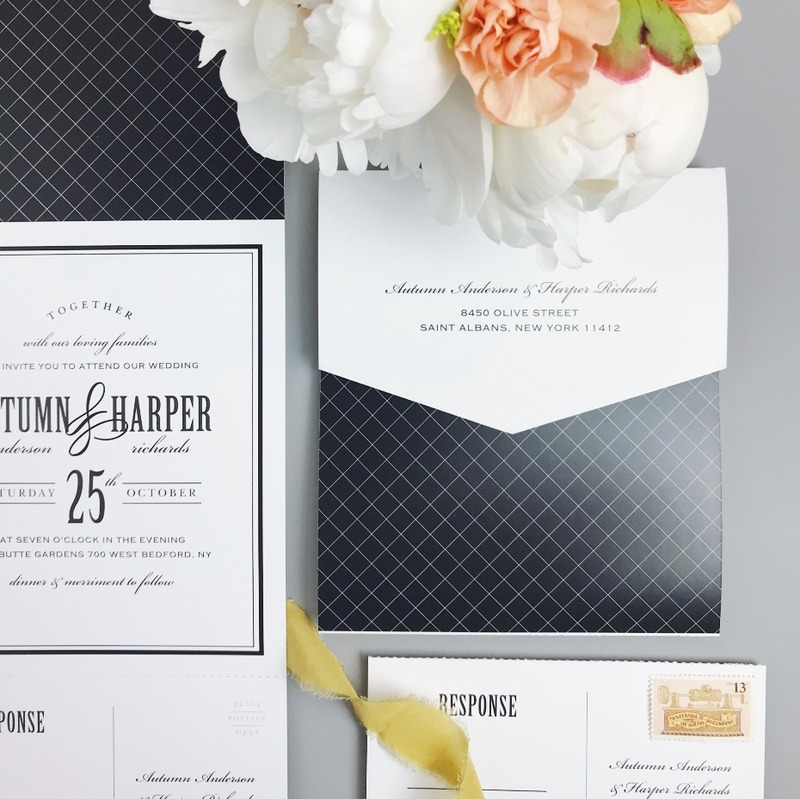 That is, until the brilliant team at Basic Invite filled us in on their newest wedding invitation line. Brides, please please pleaseeeee suspend any of your basic inclinations RN so you can feast your eyes on something that is anything but [basic]. Hello Seal & Send skus, we absolutely adore you. Signed, sealed, + delivered - The Wedding Chicks. 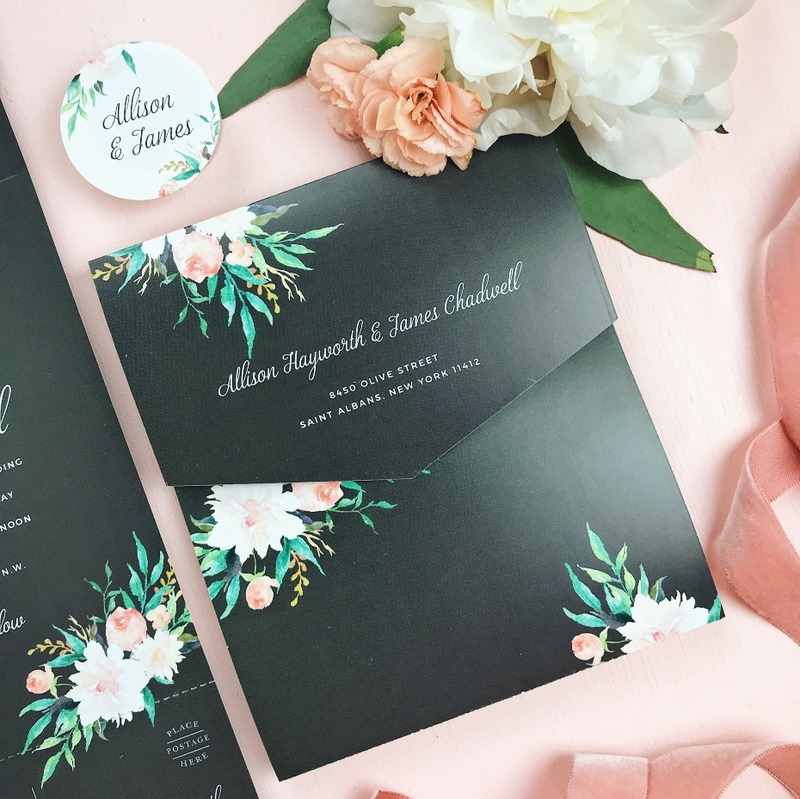 Before we jump into all the details we’re more-than digging about these designs, we’ll give you a photo to commit to memory+a description from the brand, to help fill in any gaps What you have in front of you is Basic Invite’s Seal & Send Wedding Invitations. These are an all-in-one, foldable invitation with a tear-off RSVP postcard that prints with your return address included. The line includes over 30 of BI’s most popular and timeless designs including foil options, watercolor designs, and floral looks. Each invitation comes pre-addressed with guest's addresses which means no envelope is needed! Just fold, add a stamp, and pop them in the mail. Simple, chic, and saves you time and money. One of the coolest parts about this new rollout, is the fact that couples have so many ways to personalize their Seal & Send package. 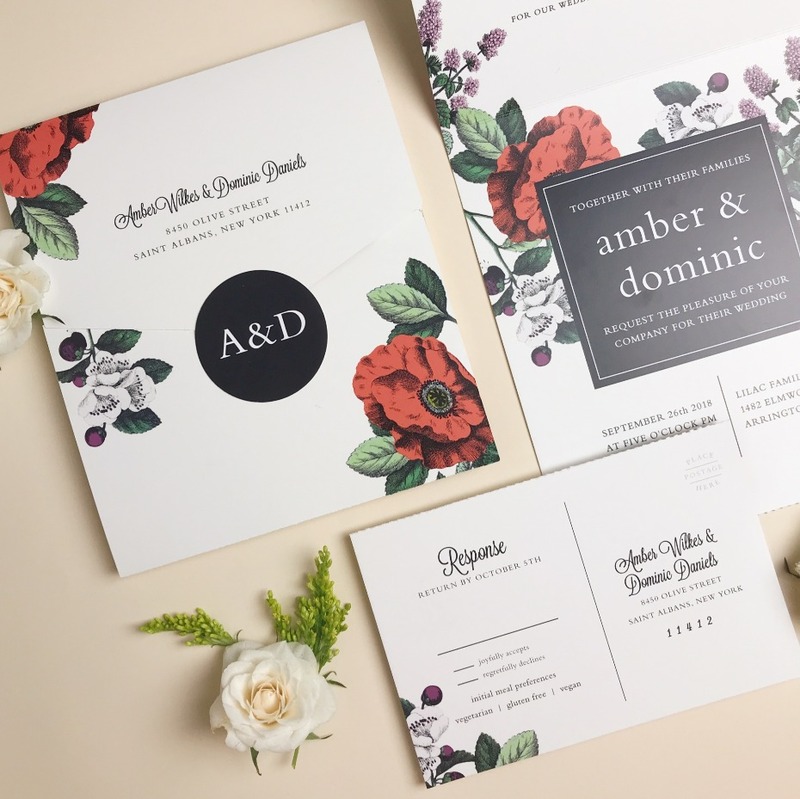 Apart from the 30+ design templates that you can start with, you still have all of the same incredible custom options as you do with one of the brand’s traditional invitations. You can tailor the look to perfectly match your wedding theme and play with virtually unlimited color options including the option to add foil to any element you choose. And if you’re not feeling the default verbiage (i.e. ‘joyfully accepts’ on the RSVP card) that comes with a design of your choosing, then you can wordsmith as much as you like! This is your wedding, you’ve got the power over the prose. As much as I loveeee everything paper, the bulk that comes with full-on invitation suites (the invite itself, the reception card, the response card, the directions+accomodations, it’s A LOT) can be totally overwhelming. With the Seal & Send invites, you do not have to stuff your invitations into an envelope or take the time to address each envelope (they already come pre-addressed). So, instead of getting that assembly line in order - i.e. someone collating all the cards, someone stuffing envelopes, someone stamping, someone addressing, etc. you can literally get your card in the mail in a matter of minutes. Basic Invite makes address collection soooo easy - with its free address collection service. All you have to do is share a link with all of your guests (or at least the ones who you need a mailing address refresher from) and have them add their address, so you’ll have them available to be printed onto your Seal & Send address fields - in any font or color that you’re coveting. And of course, you’ll have your address defaulted for the return address field, so it’ll be secure on every invitation. Aside from the perforated response card, the stickers are our FAVORITE part of this new range. You can customize the color (based on the thematic hues of the rest of the invite) and what the sticker says. So, whether it’s your initials, your new last name, your wedding date, or perhaps even a word that just totally keys up your day or describes your love - forever - you’ll have something sweet and sticky to keep all your important things together. 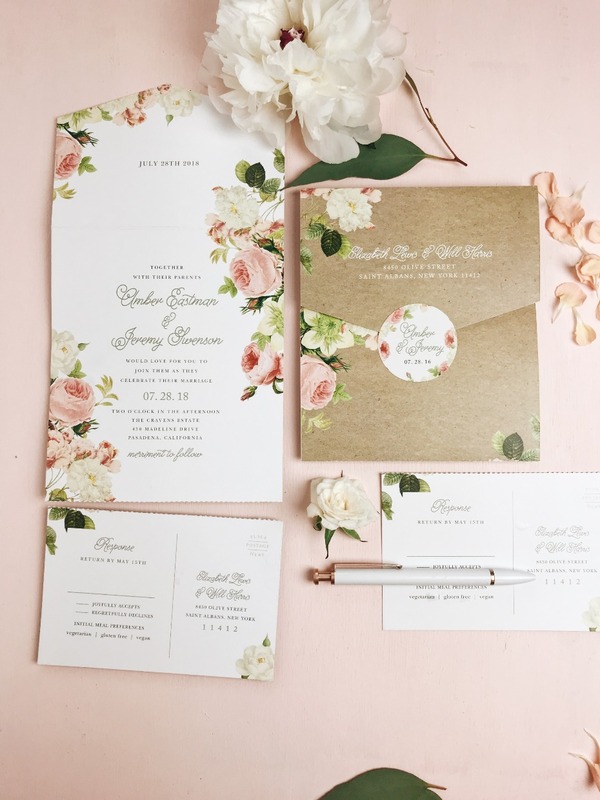 Basic Invite is one of the few websites that allows customers the ability to order a printed sample of their actual invitation so they can see exactly how it will print and how superior the paper quality is before they ever have to place their final order. Of course, everything will be 💯, but just in case you want to see your Seal & Send before it’s sealed and sent, you can do it for free! And then maybe get that sample framed to hang up on your wall… Might as well, right??! 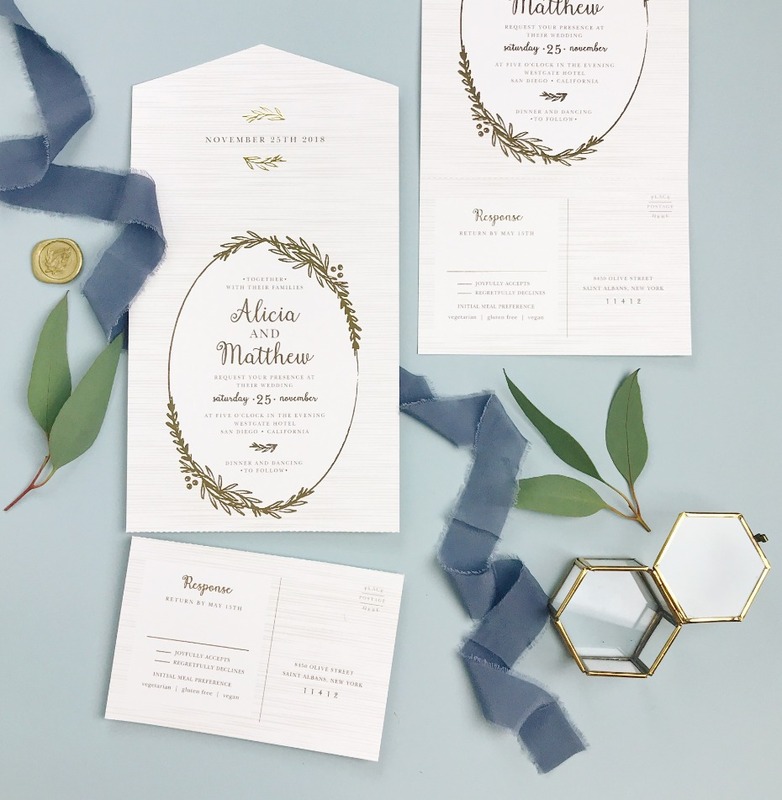 Alright, so we’re not saying that these invites are magic, and they’ll make your guests respond to the wedding on or before your RSVP date (still looking for something that can guarantee that…. Let us know if you have any ideas to light that 🔥), but because the response card is so front and center, there’s a good chance your guests will see the ‘accepts with pleasure’ part and decide now’s as good a time as any to lock in their attendance. For real, how much easier can the process be for them: just write in their names, check their status (hopefully accepting! ), choose their meal (if it’s not a table-side ordering situation), tear off the postcard and drop it in the 📫. EVER MET AN INVITE THAT DID THE WORK FOR YOU? We’re currently trying to figure out a few ways to use the new Seal & Send invites without a wedding to warrant it… but for any of you looking to make the BEST first impression on your guests - with a standout piece of stationery - this is it!! Customize yours today, and enter ‘15FF51’ at checkout for 15% off everything, sitewide. We partnered with Basic Invite to share some snippets on the brand’s new Seal & Send Wedding Invitations. As always, thank you for supporting our sponsors!